Blackfire Tyre Gel is a tyre dressing that enhances the look of tyres and protects against UV rays. 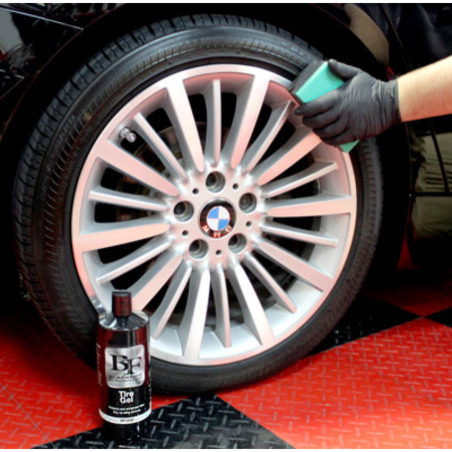 BLACKFIRE Tire Gel darkens and conditions rubber to restore the look of new tires. This thick, water-based tire dressing provides a natural, matte look with one coat or a high gloss finish with two coats. UV inhibitors and polymers protect tires to maintain their colour and flexibility. Healthy, new rubber should be dark. That's why BLACKFIRE Tire Gel is so fitting for our tire protectant gel. It restores the blackness to tyres! 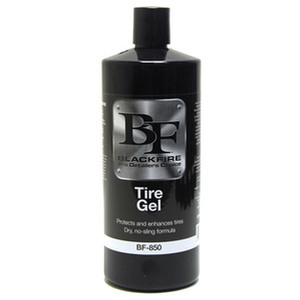 BLACKFIRE Tire Gel is a water-based formula and solvent-free. Solvents can dry out rubber and silicones can turn brown. Blackfire avoided these harmful ingredients and instead used newer, VOC-compliant compounds that offer great looks with none of the drawbacks. BLACKFIRE Tyre Gel dries quickly and does not sling. One coat will create a low-gloss, natural-looking finish. Two coats will yield a high gloss finish. Clean tyres first. Apply a thin strip of Tyre Gel to a tyre applicator and work into tyres. Remove any excess with a microfibre towel.